The August Dance Festival, which is designated as one of Japan’s significant intangible folk cultural assets, was held at Ntabaru Uganju, a sanctuary area in Nakasuji, Tarama Village from September 5 to 7 (from 8th to 10th day of the 8th month of the traditional calendar). 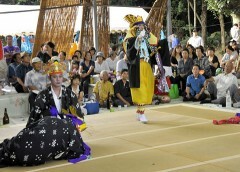 Traditional performing arts such as Kumiodori and Kyogen were performed at the Festival, which attracted many tourists. All the residents of Tarama Island dedicated themselves to making this important event a success. As part of the Ryukyuan narrative dance Kumiodori, plays such as Chushin Nakasone Toyumyagumi and Chukofujin were performed. The Okinawan capital of Shuri introduced Kumiodori to Tarama Village in the middle of the Meiji period. To begin with, the performers of Kumiodori in the Village were people who belonged to the warrior class, but commoners gradually joined in, and now there is no distinction of social classes for Kumiodori performers in the village. Kumiodori in Tarama Village has some unique aspects, one of which is that when the performers walk, they show the bottoms of their feet. On September 6, the Festival was held at Pitomata Uganju in Shiokawa in Tarama Village. On the final day of the Festival, September 7, the participants performed plays under the title of “parting” in both Nakasuji and Shiokawa.